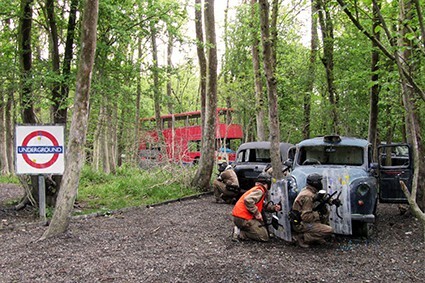 Located in Upminster, Delta Force Paintball East London is the only paintball centre that can be accessed by the London Underground, and is a 45 minute walk or short taxi ride from Upminster tube station. 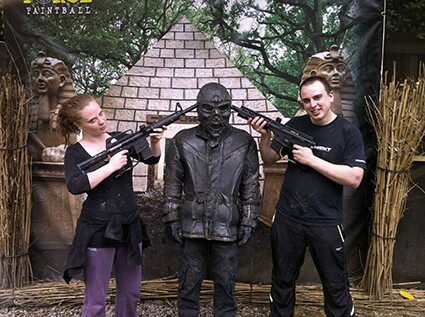 Consequently, it’s an ideal choice for paintball customers residing in London. Delta Force Paintball East London: play paintball in the city! The East London Paintball centre has 7 awesome game zones for customers to explore including: Chemical Alley, where players aim to seize control of a heavily defended fuel depot, Mad Murphy’s Jungle Attack where your task is to rescue an injured allied airman from deep inside the jungle, Command Post – set deep within the deserted hills of Afghanistan, London Apocalypse, which features several red doubler decker buses for players to use, Viet Cong Village which features an old chapel and lots of wooden village huts, Jet Hijack which has a crashed aircraft with terrified hostages inside and Zombies’ Crypt which is set on a ghostly graveyard full of scary zombies waiting to pounce! Customers can even use smoke grenades, paint grenades and MK5 Thunderflashes during their game to liven up the action. But, it’s not just the opposing team that poses a threat in the woods – you’ll also need to be mindful of the Delta Force Paintball Terminator! Armed with two lethal BT4 semi-automatic paintball guns, the Terminator can appear in any game at any time without warning, looking for a fight! If he decides it’s you he wants to face in battle, he’ll raise his guns and point them in your direction. Then, it’s up to you whether to accept his challenge: if you don’t, then you’ll just have to ignore him and hope that he finds another opponent. But, if you do, simply open fire at him! If he believes you’re a worthy foe, he’ll give up one of his awesome guns for you to use for the remainder of the game. It’s the only way you’ll get your hands on one of his deadly weapons – so make sure you keep your eyes peeled when you’re out at war!